The Jaminawa are primarily located within the State of Acre, near the borders of Brazil, Peru and Bolivia. This particular Jaminawa village has a population of approximately 50 members and is situated on the Xapuri River. Pictured are thatched roof, open porch houses which are typical of homes within Jaminawa villages. While fishing meets the protein needs for most of the Jaminawa, each family raises domesticated animals such as sheep, pigs, and chickens. In addition, each family clears and maintains small plots of tree and root crops. Traditional Jaminawa ornamentation includes pierced noses with a necklace draped over the ears. This practice is ceremonial for both men and women. Traveling by canoe on the Xapuri River is the primary means by which the Jaminawa move from one village to another or visit Brazilian settlements. 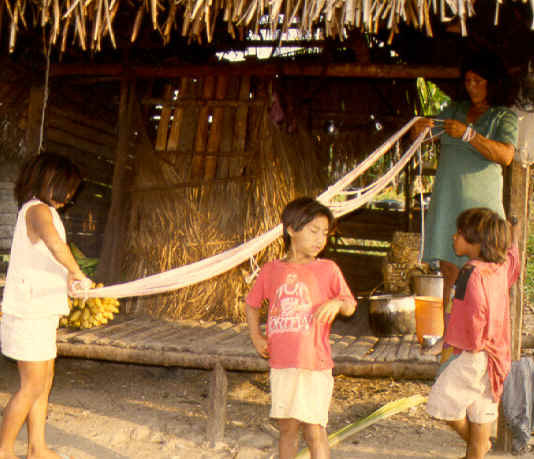 Jaminawa women spin wild cotton to make thick string used in the weaving of hammocks and handbags. These items are made for their own use as well as trading with the Brazilians who travel the river. Jaminawa men hunt, fish, and clear the forest in order to plant their crops. The women pictured here are performing the daily activities such as weaving baskets and collecting fire wood. The child is carrying the wash back to her house.